Capone's Dinner & Show Orlando is gratified by all the positive E-mails we receive from people who have seen the show. We have posted just a few of the many comments on this page. You can also visit our FACEBOOK PAGE to view guests who have reviewed us, posted pictures and more. With over 10,000 fans and growing, we have received little (if any) negative feedback from our Facebook followers. While it's impossible to please all guests we certainly do our best. If for ANY reason you are dissatisfied with our dinner or show please ask to speak to a manager so we can try to please your party. Guest satisfaction is Capone's Dinner & Show's top priority. 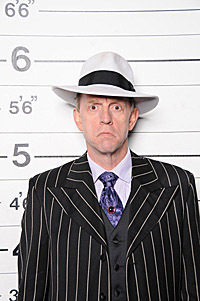 My name is John Kucik and I am the principal owner of Capone's Dinner & Show, Inc., and I am always willing to listen. So if you're still not happy, call and ask for me. Our dinner show attraction has been awarded a certificate of excellence year after year. We are consistently ranked in the top 3 Dinner Theaters, Concerts & Shows in Kissimmee. Come see for yourself why we are a one-of-a-kind dinner show not to be missed! Went to this show to make my girlfriend happy. seen the clips on you tube and was not to impressed. We get to the building and this this guy in a zoot suit hanging out with the whole line keeping everyone entertained while we all wait for the doors to open. Once it was time to go into the show, it was like you are at the mob hang out spot... secret doors, passwords..... loud cocky Italians just like you would think the mob guys were. the food..... All you can eat Italian food. meatballs, spaghetti, chicken parmigiana, pot roast, ham, mash potatoes/ gravy... bread sticks. All the food was great. Now they do advertise UNLIMITED DRINKS.... beer, couple mixed drink choices, and soda........ the mixed drinks are not watered down, the beer is cold and the soda is soda. and your cup will never be empty.. We had Joey Too Slow as our waiter and he was great, i was drinking beer and my girlfriend was drinking rum and coke. we never looked for the waiter for a refill, our cups were always full or half empty.. GREAT SERVICE!!!!!! The Show ........FUN!!! I was stunned at the whole thing. they really got the act down. never missed a beat!! your cheeks will hurt leaving this place. They have a scripted show they go by, but there was a lot of improv also throughout the show.. which made the show that much better! while on our trip we went to three shows.. Pirates, Arabian nights and this show.. three totally different shows but hands down the Capone Dinner and Show was the best! by the way there is a coupon in one of the tourist guide books that gives you 50% discount on the show/dinner. Just wanted to say Thank you so much for making our 40th wedding anniversary so special. We had such a wonderful, entertaining evening. The show, the food, and staff were all outstanding. We would include Capone's Dinner Theater as a must do, the next time we are in the Orlando area. Thanks again for such a great night of fun. We are on the last week of our holiday and decided to visit you tonight 5th Oct 2010. Our sides are still hurting and we're not sure if it's from the amount of food and endless drinks our waiter Mickey kept supplying, or from the amount of laughing we did! Your show is excellent, from the way you're greeted when you enter Capone's through to the end of the show it's a whole night of entertainment at an amazing price, the cheapest and best show we have seen! Well done to everyone involved, we look forward to seeing you again soon and will recommend you to anyone visiting. Just wanted to show our appreciation for such a wonderful show. It was an anniversary celebration and it couldn't have been better. It was the greatest entertainment. The food was terrific and the support staff were a joy. Not mentioning, of course the great entertainment from the show. For all of you that are visiting the Orlando area – don't miss this wonderful evening. We attended your show tonight [Sept.5, 2010] and had a wonderful time. Great experience! We laughed until our sides hurt. "Vito" was an excellent waiter but the whole staff was fun. This is a great value and we all can highly recommend. We just enjoyed the HECK out of ourselves!!! My husband and I visited Al Capone's on the night of July 14th while on vacation on Orlando. We read many positive things about the place online and we were not disappointed. The food was superb, the singing and dancing were great, and the atmosphere was amazing. We enjoyed the experience so much, we will certainly go again if we ever go back to Orlando! Thank you so much for such an amazing time! Hi We attended the show while vacationing in Orlando. "It was the highlight of our vacation. Our waitress TonI could not have been any nicer." She went out of her way to ssure that we had a great time. - Tom & Maureen H.
We have just returned from a vacation to Orlando, FL. Many of the places we went to, bent over backwards to help us the best they could, we also had my service dog with us. To name a few of the places that went out of their way are, ALL the Disney Parks, Gatorland , Capone's Dinner & Show, plus our hotel accommodation's at Buena Vista Suites. On a whole we had an OK experience going to Orlando...the places that did above the call of duty were great and I would go back to them. Thank you for making my 34th birthday SO enjoyable...I have already recommended the dinner show to others on facebook! Just got home from best show ever!! Had a group of 30 from our Church and neighbors. I got the bigger kick out of watching all of them laugh until they were in tears. Highly recommended We celebrated our Anniv. tonight, we shall return. The 44 members of Blue Ridge Pioneers that attended the dinner and show on Wednesday, January 13 thoroughly enjoyed the performance. Our group was seated in a timely fashion and the servers were very courteous. The buffet was plentiful and tasty and the beverage selections quite generous. One of our members was selected to be on the stage and everyone laughed at the humorous antics he displayed. We'd definitely recommend Capone's to anyone wanting an entertaining evening. Thanks for your assistance with the purchase of our tickets. Hi Capone's, I have been a fan of Capone's since friends introduced it to me in the late 90's. When I got married, I took my husband to celebrate our birthdays. So for the last 4 years we have made Capone's a birthday celebration event. Each year it's different and fun (because of the group we bring with us), but at the same time it's like going home each year. Last night we celebrated our two birthdays again and we have heard nothing but rave reviews from our friends and family that attended with us. Our sides hurt so much from laughing so hard last night!!!!! We are all going back soon! Not going to wait a year for the next visit. Miss Jewel and cast are fabulous! They are talented, funny and it makes our whole experience worth while. WHAT A SHOW!! Just wanted to e-mail you to let you know what a great time our family had at your dinner show. Our three kids all had a blast and we adults believe Capone's offers the best value for the dollar by far. We have been to many dinner shows and Capone's beats them all! Great job to everyone at Capone's!! - Randy & Heather T. and the kids! We visited Al Capones Show on Oct. 28....I must say the food was absolutely incredible. Our servers name was bullet, he made sure that our drinks were filled to the rim...We didn't have to ask for refills because he was right on it....If you want a good value for your money then check out Capones – the actors and singers were fantastic, had me singing along with them. We are planning on coming next year for my daughters graduation, this time with a bigger group. Thanks for a great show!! My wife and I came in on Oct 8 2009. The food was awesome the show was great the staff when our drinks were empty would be refilled right away. The package including the motel was a great value we will be back again soon had a great time. I went to your show in September 2009. Thoroughly enjoyed the experience. I've never done a Dinner Show before and was a little apprehensive but our server made the night magical. He was funny and well into his part. He also took part in the show. Thanks for a wonderful time/show - real and imaginative. Best Wishes for the future. Thank you so very kindly for accommodating us and the great accommodations. The group thoroughly enjoyed everything. I mean everything! The seating, the drinks, the food, the fun, the laughs, the staff, being acknowledged, everything was wonderful. I have already recommended it to another group that's making plans to visit Orlando. Again, I thank you so very kindly! Hi Gang! I just wanted to thank you for making my 40th birthday on August 19, 2009 a great one. We had so much fun, the show, the beautiful cast, as well as the food was excellent. Our waiter Tiny was great too. Hope to be able to come back down soon to see the show again. Love from your friends in NY. We thoroughly enjoyed Capone’s. The food was excellent, the show was entertaining and very funny, and it was overall the best evening we spent while on vacation. We will definitely go again the next time we are in Orlando and will recommend it to all of our friends and family who are traveling to the Orlando area. Just a quick thank you for giving us the best night out during our recent visit to Florida. Along with my wife, son & his partner none of us could fault the whole experience. It was truly fun and great value night out. The cast and waiters together put on a great show which left us all disappointed when it was time to leave. Capone’s will be top of my things to do list on my next visit to Florida. Thanks again you were great. I am taking the time to email you and tell you what a great time [my] Family had when we visited you on June 25th of 2009. I have not laughed this hard in a long time. The interaction with the audience was great and very amusing. I will travel again from PA to Fl. To see the show again. There was plenty to eat and the food was good. I highly recommend this establishment to anyone who is looking for a great time and lots of laughter. This was the highlight of our 2 week vacation. Thanks for a great time!!!! We were on vacation from the U.K. from 22nd March to 15th April. Whilst we were there our daughter got married and we had family travel down from New Jersey for the occasion. We thought about how we could best spend our last evening with them before they returned to N.J. so we decided to take in your show on 27th March. We don't have anything like this in the U.K. so weren't sure what to expect. We can only sum up what we were exposed to in one word BRILLIANT. From the secret knock and password to gain entry to the "photo call" once in really added to the flavour of the evening. The food was plentiful and delicious and the drink flowed freely. The show was hilarious and the singing superb. The interactions between the cast and waiters is ingenious and really works. In all this was an excellent evenings entertainment and we were sorry when it ended. We really did make the right decision on how to spend our last evening together. Can you please pass on our appreciation to everyone concerned for their hard work in striving to make this a night to remember... We did take in another dinner show during our stay but were disappointed with it having been so well entertained by you. I guess you must have spoilt us. - The Hammond family, U.K.
My husband and I were there Tuesday evening... and sat in front at Johnnie’s table... This was my 5th or 6th trip and I am addicted to Capone’s. Every show has been different and exciting. We have soooo much fun when we are there and love the way everybody interacts with the audience members. The food has greatly improved from the original visit and everything is prepared excellently. Thanks for a Great Time from the Past!!!! ...pleasantly surprised. Show was a blast! It is real hard to get a chuckle from me. The passing encounters between the stage cast, performing servers and patrons set a friendly tone of amusing excitement. It proves to wow and slays patrons into up-the-wall fits of belly-shaking laughter. A test of improv at its best, far from off the cob and delivered full of moxie. - Marie, Capt., USAFR Ret. My husband and I visited Saturday night to celebrate our anniversary and my birthday. Thank you so much for such a wonderful time! We haven't laughed as much as we did Saturday night! Keep up the great work, and I'll try to get a gang of us together to visit again! My family came to dinner...and we were highly entertained. My three year old daughter has been walking around telling everyone to "smear her lipstick!" Thanks for a great show! Dear All, Would like to take this opportunity to thank you all for an absolutely fantastic dinner show on my birthday, 3rd Nov this year. I return frequently to the states to see family and this vacation was sealed with a totally professionally ran show. The moment I arrived, my partner and I were made to feel very welcome, were utterly swamped and consumed into a world of 20's, 30's Chicago style Gangsters, in every way..... The table servers were switched on, wised up, on top form with their entertaining wise cracks, and one liners, stage cast members were faultless, superb with ad libbing when customers heckled and bantered......drunk customers! The whole package from entry to exit, was worth every dime, unreal experience and from me, no doubt highly recommended. As related to the Kennedy clan, it was highly amusing as staff gradually came to believe this after seeing my table card, they didnt faulter once, rose to the moment, well earned tip....a first class service to us all. I have been to many styles of shows and this topped them all. Thank you once again for giving my partner Tracey and I such a swell time and valuable memories to treasure for many years. Hope to see you all again soon! I really enjoyed the show Superbowl Sunday Night 2012. and this comng from someone who has been to 2007 and 2010 Superbowl. BUT--DO NOT CHANGE A THING! I had one Pina Colada, so it wasnt a drunk thing. I live in Waterford Lakes, Orlando and hope that you see one of my 650 Facebook Friends in your "Joint" soon! Each one of the staff members really made my professional vacationing parents from Seattle, The Anderson's feel like they were at a production by Disney. I can't say it enough, everyone really was fantastic with the add-libbing, audience participations, songs and script! Bravo guys. OH and if you remember me, I'm the blond with the Burberry Fedora and turned The Big 40...I didnt mention my age aloud. Embrassing my inner cougar tho...lol. I plan on returning within the next few months! I wanted to let you know that our party of 4 really enjoyed the show last night, 12/9/11. My husband and myself treated my friend and her 12 year old son to an evening out, and that is what we all chose to do. They all enjoyed the buffet, I was not so lucky, but I do not hold that against the show, not everyone has a good experience with buffets, and our waiter, Bullets, did his very best to correct the situation. Bullets put his heart and soul into his roll as a mobster, and he did it extremely well. He seemed to excel at it, far beyond some of the other waiters, who were not as good in the acting department, but they all did their best and made the night very enjoyable. The actors in the show were great, and I am sure I will forever hear "I've been forked", "Fork you", and several other key phrases. Being in a wheelchair and on oxygen can sometimes cause others to be uncomfortable, but Bullets even made a comment about turning up the oxygen and sending me up like a rocket! Most people are not clever enough to treat the handicapped like regular folks, but he did. And the little extra he offered, because I was unable to do for myself, let me know he cared enough to do his job very well. Again, we did enjoy the show, and hope to see it again, perhaps this summer when the snowbirds are gone, and there will be no holiday theme, so we will see a different type of show. "...just wanted to take a moment to let you know how much my family and I enjoyed your dinner show last month while visiting Orlando. Over the years we have been to the area several times and have seen almost all of the area dinner shows. "Yours was hands down the best we have seen. The food was excellent, the cost very reasonable and the show itself was fantastic. My kids and I had an absolute blast and will be sure to do it again the next time we visit. I'm sure to tell anyone I know that is heading to Orlando to see your great show. - Thank you." I am a Mears motor coach driver and brought a large group of VFW guests to see your show last night and I can't tell you how much fun it was. I loved it as much as they did. The cast was GREAT and we laughed the entire time we were there! I especially loved the interaction with the guests as it made it even that much more fun. You have a GREAT cast and I hope to come again with a group of my own friends one day soon. I enjoyed the show so much... Oh, by the way, the food was really good too! I just wanted to say Thank You for such a great show and Dinner. Your food was great and the show was wonderful. Such a bargain... these days we need more places like yours. Our whole family loved it. Thank you for a wonderful night. We will be back the next time we go to Disney. My family and I were in Kissimmee last week on vacation from the Toronto area and my wife and I had the chance to stop at Al Capone's while Grandma watched the kids. Amazing show!!! One of the best times we have had. We are telling everyone we know. We had good food, drink and loads of laughs. We will be back!!! Still want to read more guest comments? We have indexed dozens of comments from our fans. Access these comments by visiting our fan’s dinner show review section.